Oh King Tut! The most famous of all the Ancient Egyptian pharaohs for really no reason besides that he plays hide-and-seek while dead really well. lol I don’t feel either way for this teenage pharaoh but the discovery of his pristine tomb is an absolutely fascinating for art history and the precious objects left behind can give us a glimpse into the funerary practices of the other pharaohs whose tombs were looted in antiquity. At first I could see nothing, the hot air escaping from the chamber causing the candle flame to flicker, but presently, as my eyes grew accustomed to the lights, details of the room within emerged slowly from the mist, strange animals, statues, and gold –everywhere the glint of gold. –Howard Carter and A. C. Mace, The Tomb of Tut-ankh-amen (New York City: Cooper Square Publishers. 1933), (vol. 1) pp. 95-96. 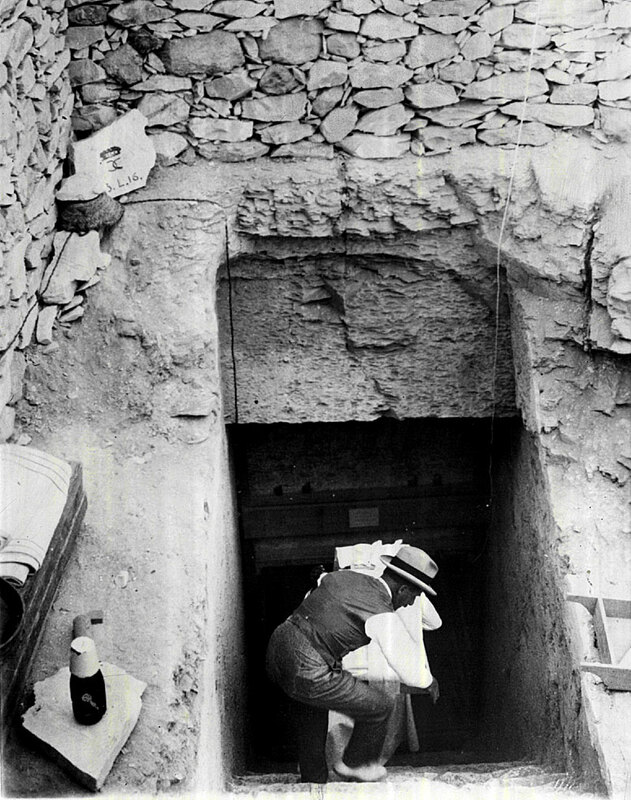 The fact that this tomb remained hidden for thousands of years is significant because most pharaoh’s tombs were looted early after their deaths, meaning that archeologists only had partial glimpses into the funerary traditions of ancient Egypt. Even the Great Pyramids were completely looted before serious archaeology could be conducted. I mean, hello!, you literally have a beacon saying: “Hey I am filled with gold and precious objects. Come rob me!” And so they did. The specific image from the 250, the innermost coffin, is only a small part of the larger tomb but it would take wayyyy too long to go into detail of the whole tomb in class. I do, however, briefly show my students a layout of the tomb because it helps them visualize the amount precious objects pharaohs (even a minor one) were buried with. In the image above you can see the room with many layers of coffins and sarcophagi. The specific layer I am going to focus on is the innermost coffin, the one closest to the mummy. This piece was made of solid gold, yup you read that right, SOLID GOLD. As a reminder pharaohs were believed to be divine and since the gods were thought to have skin of gold the pharaohs were buried with as much of it as possible. The face of the pharaoh followed Egyptian art convention: he is idealized and eternal, holds the crook and flail (symbols of royal power and authority), wearing a false beard and the nemes headdress with the cobra (Wadjet) and vulture goddesses Nekhbet on his forehead. All of these things can be seen in images of pharaohs throughout history (even female pharaohs like Hatshepsut). However, keep in mind that this tomb and specifically the innermost coffin were NEVER meant to be on display as they are now in museums; they were objects for the dead and the gods alone. 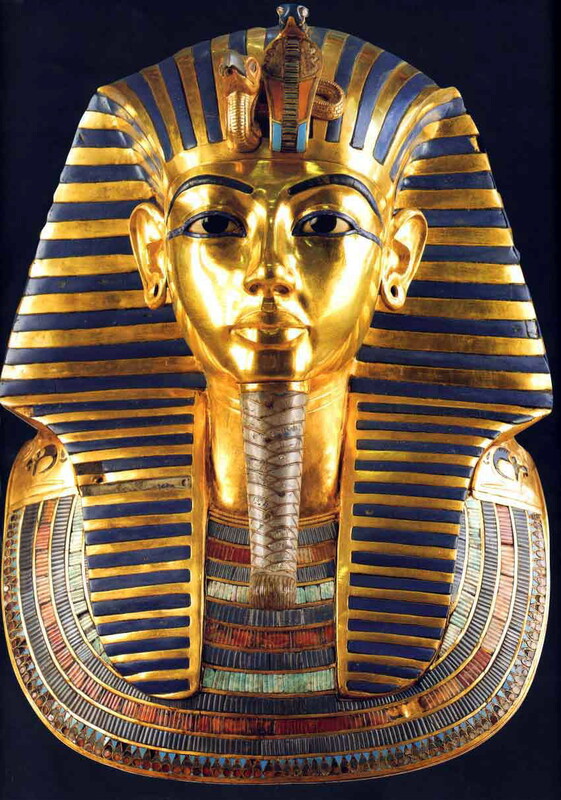 I like to remind my students that King Tut was a minor pharaoh, dying in his teens, so that they can imagine what the pyramids, who were built by great pharaohs, were filled with! P.S. Pharaoh Akhenaten, is believed to be King Tut’s father, remember him from the Amarna Period and the previous AP Art History post? Next Time: #24 Last judgment of Hu-Nefer, from his tomb (page from the Book of the Dead). New Kingdom, 19th Dynasty. c. 1275 BCE. Painted papyrus scroll. I really enjoy your posts! Pls keep them coming – I use them in my APAH class or for some interesting extra background for me. Sweet, thank you. Unfortunately I can’t write as fast as you need them! Anything in particular you’d like to see for upcoming posts?